This is a ride I've haved some difficulty naming. 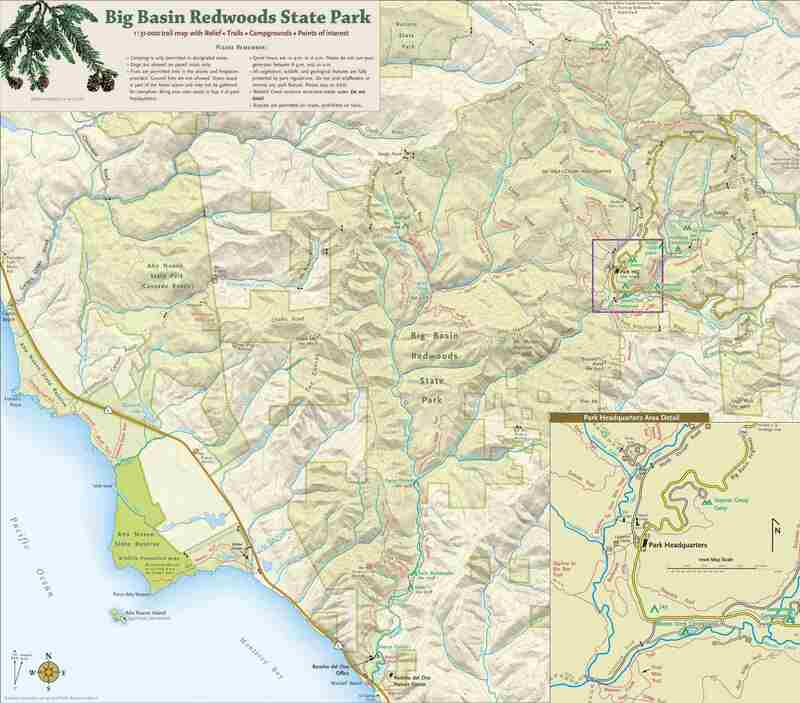 The area is part of the Big Basin Redwoods State Park, so it could be considered correct to call it "Big Basin". This part of Big Basin (including the entrance sign and visitor center) is called Rancho Del Oso, so that could be the name. It could be called Waddell Creek, because that's the name of the creek that the trail follows and of the beach at the trailhead. It could even be called Skyline-to-the-Sea Trail, because the vast majority of the route is on that trail. Still, I decided to call it the "Berry Creek Falls" ride, in reference to the reward that awaits at the end of the ride. On the face of it, this is a very easy fire-road ride with a short hike tagged on at the end. You can bring the family and kids along. It's a very gentle rise from the coast, easy enough that you can call it "flat". There are a handful of slopes near the turnaround point of the ride that will present a little challenge to family members who do not ride regularly, but nothing that experienced riders will notice much. Beyond that, the ride actually has a little more to offer, in that some substantial stretches of it consists of singletrack (saying nothing of the pretty waterfall that awaits at the end). A lot of this is singletrack that's merely a narrowed-down version of what used to be a wide dirt road. So, it's flat and smooth. While that's not enough to satisfy any hankerin' for technical singletrack, it's enough to make the trail a little extra charming. The ride takes place on Skyline-to-the-Sea Trail. As its name suggests, this trail is actually a pretty long one that stretches all the way from Skyline Boulevard (near Saratoga Gap) to Waddell Beach on the coast. The biking portion of this route constitutes the only bike-legal segment of that trail. And a portion of the bike-legal segment (near the coast) has a hiking-only alternate too that parallels the wider trail. The ride is essentially flat, but it's not without its mild ups and downs in a few places. None of these is anything to worry about. They typically don't exceed 7% grade, though I think the steepest single one might reach 10%. More importantly, though, none of the slopes on the ride that are steeper than, say, 5% grade last any more than a few dozen feet. They are merely minor "humps" on the trail. As for the overall slope of the trail, you'll really only notice it more on the return half of the ride when it's barely enough to coast for any substantial distances. While the first mile or two of the route features many segments that get direct sunlight, most of the remaining ride takes place in moderately dense tree cover. The foliage ranges from broad-leaved riparian plant communities to fairly shady redwood groves. This not only means that the ride takes place in beautiful nature, but, combined with the proximity of the location to the ocean coast, it also happens to make this a good ride option for a hot day. There is one short singletrack detour section along the way for bypassing a washed-out portion of the main dirt road. This has steep parts and narrow spots, and even a couple of switchbacks. If you take your family with you, this is still short enough to be walked through in a minute or two. For the seasoned mountain biker, it's a brief opportunity for some fun on an otherwise very subdued ride. The bike-legal trail dead-ends at a creek crossing where there is a bike rack to which you can chain your bike. So, you'll want to bring a bike lock with you, unless you're a remarkably trusting person and will be okay with just leaving your bike there unlocked. After that, there's a half-mile hike further up the trail starting on the other side of the creek, before you reach Berry Creek Falls itself. There's also a shallow creek crossing along the way over two aluminum I-beams. The falls is fairly narrow but about 70 feet high and, needless to say, will look more impressive if you visit shortly after some significant rainfall. Keep in mind that the total climb and distance stats as well as the elevation chart shown here also include the hike portion of the trip. The point where you park the bikes and start walking is reflected on both the topographic map and the highlighted park map available on the left. The time estimate includes the hike portion as well, but includes no amount of time spent while at the falls.